Investigators Tuesday were piecing together the events leading up to the separate killings of an 86-year-old grandmother and her 58-year-old son-in-law in Moreno Valley, and a shootout that wounded a deputy. Riverside County sheriff's officials said the investigation was "fluid," but confirmed that the woman was shot dead in an SUV at a gas station on Sunnymead Ranch Road and Old Lake Drive. A few miles south, a man was killed at a home on Delphinium Avenue near Kitching Street. A grandmother and her relative were killed in separate shootings in Moreno Valley., and authorities continued their search for at least two gunmen. Robert Kovacik reports from Moreno Valley for the NBC4 News at 11 on Tuesday, July 22, 2014. About 2:40 p.m, roughly 30 minutes after the woman's killing, a deputy who was responding to a call about an assault with a deadly weapon became involved in a gun battle with a gunman wearing body armor and firing an AR-15 rifle, sheriff's officials said. "A Moreno Valley officer that was involved in that shooting was in fact injured by gunfire, but is at home and recovering. 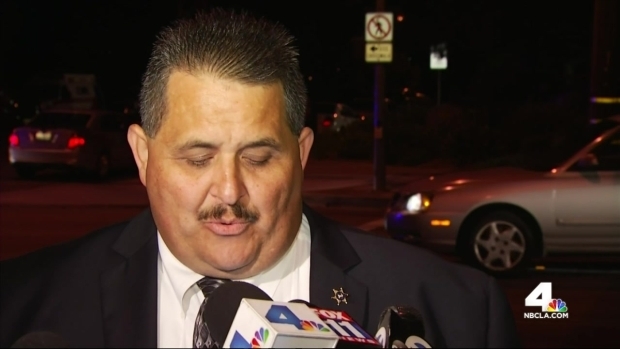 Fortunately, his injuries were not life-threatening," Moreno Valley Police Chief Joel Ontiveros. He was recovering at home after being treated at a hospital. 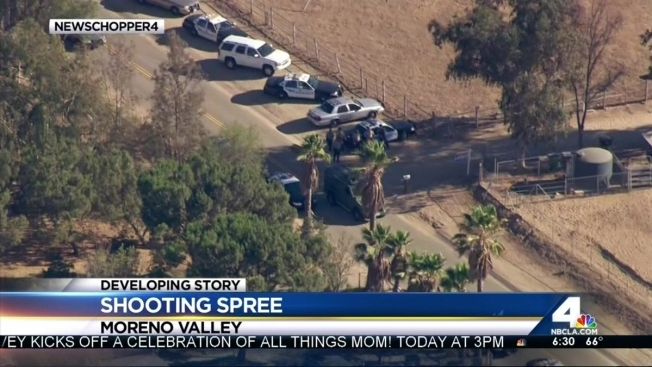 A sheriff's deputy was wounded in Moreno Valley during a shootout between several suspects. 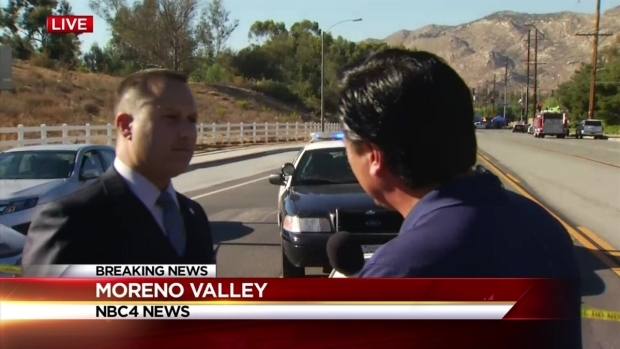 Tony Shin reports for NBC4 News at 6 p.m. from Moreno Valley Tuesday, July 22, 2014. Sheriff's officials said all three incidents were related, but did not say how. Residents were urged to stay inside their homes during a manhunt in a rural area near Pigeon Pass Road and Old Lake Drive (map) for at least two gunmen carrying assault rifles. A description was not available. Dozens of searchers in protective gear and toting assault rifles canvassed the area into the night. "There are one or more suspects that remain outstanding and we hope to have them in custody soon," Ontiveros said. Earlier, aerial footage showed SWAT members carrying someone down a hillside as others huddled around an armored vehicle parked along a dirt road. Other deputies had their guns drawn as they surrounded a home perched on a hill. Pigeon Pass Road and Old Lake Drive were shut down during the investigation. The slain woman’s son, Randy Green, identified her as Wilma Patterson (pictured right). Green identified the man killed in the home as his brother-in-law, Derek Hardy. "It's ridiculous and I don't know if this is connected. I don't know what's going on right now, we're clueless," he said. Green said his mother "cared for everybody," gave away bicycles to neighborhood children and dreamed of opening a homeless shelter. She battled lupus and cancer. He described his brother-in-law as a "good family man." "All I know is that my mom is sitting over there dead, shot and it's going to spear me for the rest of my life and change the family, you know? Where do we go from here?" Green said. Witnesses in the area of the gas station said they heard eight or nine shots fired, many of them striking the white SUV carrying Patterson. The driver side of the windshield was shattered by gunfire. Robert Kovacik contributed to this report.